Every ergonomically designed workstation starts with a well-designed keyboard system. The line of Custom Accents® keyboard trays supports a healthy work environment by allowing users to have a correct typing posture, which helps to reduce back pain and carpal tunnel syndrome. Made of the highest quality materials, we are confident that our line of keyboard trays will help to provide your clients with a healthy work environment for years to come. -Fully articulating with one touch for easy positioning. -Swivels, retracts and slides on track features. 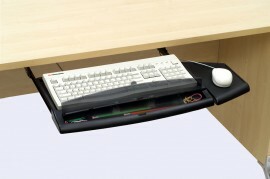 -Removable pencil tray allows Microsoft ergonomic keyboard compatibility. -Reversible mouse trays for left and right handed users. -Comfort gel wrist and mouse pads. -Adjustable back stops to keep keyboard in place. -Trays lock in position when in use. 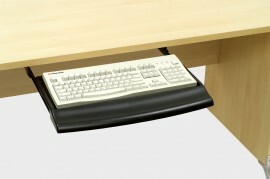 -Includes sliding track and mounting hardware included in all keyboards.